i had no idea it was there. waiting for me, maybe. wondering when in the world i’d discover it, lying there in the shadow of the drawer i’d not opened in a very long time. oh, my mama had urged me up there. not to slide open the drawer, but to look at the boxes at the back of the closet. boxes i’d tucked there long long ago. baby clothes, all of the boxes, doll-sized mittens and onesies and little gap overalls. somethings i’d sifted through, tucked off to the side, hoping, waiting. maybe someday there’d be a reason, a brother with reason to lug home the boxes. maybe a new baby would come, would finally come. and so, this past long slow weekend, puttering about my mama’s old house, the house i grew up in, i somehow found myself pulled back to my room. maybe at first it was that ol’ twinge of guilt, oh, geez, those boxes, might as well get to the boxes, see if it’s time yet to part with those wee tiny treasures. but then, for no reason, i swear, just an urge, a wisp of a whisper calling me maybe, i slid open the very top drawer. and there, for the very first time, i saw a whole stash of papers, yellowed a bit, worn at the edges, stacked, one after another. i started to read. my heart quickened, then pounded. suddenly, certainly, i knew i had found lost pieces of a puzzle i’d put off to the side. these were essentials. turning points, each of them, in the life of my father. only i’d not ever seen them, not known, really, they existed. it was as if history, over the years, had done all the work there in the dark while i wasn’t looking. it was sifted, condensed, it told whole threads of the story. threads in my mind, over time, over decades, that had started to blur. there is that fine line in every unfurling of a family’s story, where truth drops off and myth takes over. fills in the lapses, bridges the gaps. i’d long ago lost track of which was which, and figured some chunks of the story had slipped into the warp of what happens when the sharp pierce of too-early death loses its sting, and in its place, story is laid, etched in the sands of family telling. you simply stop looking for truth. you take the story as it’s handed to you. there is a balm in believing. you like a dash of amplification–glorified truth, perhaps–tossed in your old family tale. yes, yes, your grandmother was the first woman in the state of kentucky to graduate college. yes, you like that. like the ring of that tale. yes, yes, your papa turned down harvard law school. had work to be done, and children to raise. what woulda been, coulda been, doesn’t much matter. if, in telling the story, you can cling to the posts of what might or might not inflate a key player, provide something more to hold onto, there in the dark and the murk of a life’s fading twilight. and so, after all those years of not really knowing any more, of occasionally feeling the itch of is-that-quite-true-or-is-it-a-bit-of-a-fib, i’d come to not count quite so much on a firm underpinning of fact. it all blurred. simply became the story we told. but deep down, i am–as my father told me his very last christmas–a girl with a deep sense of history. i like my stories to line up, the facts to fall into place, because they belong there. i am, after years of writing in medical charts, and even more years of writing everyday history in the pages of news, best suited–most settled–when the timbers of my story are nailed down in truth. and so, there in my hands, my hands that were feeling the rush of discovery, of having stumbled on something that told the crux of the story, i moved from standing there, quivering, to dropping and curling my legs on the quilt of the bed that so many nights had shipped me to dreams. and there it was, on harvard business school letterhead. a note, penned in the summer of 1953, acknowledging that my papa would not, for choices all his own, be attending in the fall. the place would be held, the admissions deputy wrote, should he ever change his mind. i sat there beholding this new, never-known, or could-it-be-merely-forgotten, thread to my father’s story. i couldn’t help, later that night, poking around the keys on my keyboard, looking up the HBS class of 1955, to see what titans of industry mighta been classmates, mighta known and loved my gregarious–and dare i say, brilliant–father. but before i got to that, i sat there, feeling the great granite slab of foundation settle into its lasting place. what might have been myth, blurry, unfounded, was, with a slip of thick ivory paper, turned into fact. a crisp edge of history–my papa’s history, my sense of the man who’d always been my bright light and hero–was sealed. the fingers of time, run down the fold, neatly tucked it away, filed at last under t as in truth. never again as i told of my father would i feel the ground quake under my story, as, behind the occasional passage, i wondered if i’d trespassed the truth, tiptoed to fiction. and that wasn’t the only piece of the past that came to me, there on the bed, as the sun slipped away over the treetops that circle the pond out my long-ago window. layer after layer, memo after letter after letter after old crinkled black-and-white photo. some of the layers typed on tissuey paper, the sort that looped like a sticking-out tongue through a key-sticking typewriter. some scrawled in the handprint of long-muffled heroes, the ones who loomed large in their day and their time and their page of the story. by the end of an hour or so, my face wet with tears, with joy, with pride, with unbearable sorrow, with feeling again the scab of my heart ripped off and bleeding, i clutched the thick stack, the marvel of all of it. there in the drawer at the top of the dresser, there where growing up i’d always tucked all my treasures, my things i wanted no one else to see–my eyeshadow snuck in the house, my love notes to boys i had crushes on, my rosary from first holy communion–there in the shadows of the one place where i’d kept what mattered the most, i discovered that history had done all the work. lined up the truth, one after another. gave me the gift of a verifiable version of who was my papa–not only to me, but to all of the world. more than ever that night, or maybe only more than in a very long time, i ached for the man whose story i’d only just more deeply discovered. it all–and more–came flooding back to me. how i stood there in the kitchen, right after my papa’s funeral, and how my uncle, a wise man, spoke to me the words that for years were my solace: the depth of the pain equals the depth of the love. so many nights, and again just the other one, i clung to the cramp in my heart, and named it the love of my papa. only this night, as i remembered the feel of his arms wrapped around me, felt once again the breadth of his chest as i leaned in my head, i cried out for the papa i’d not wholly known for years and for years. but who now–because, at last, i tugged open the very top drawer–i knew more than ever, and missed all the more gapingly. have you discovered bits of the story of those who came, and maybe left, before you? have you stumbled upon history, only to be shaken by what you found? that you’d known it all wrong, or tripped upon the missing pieces to puzzles? have you wondered where the outlines of history blurred, and where myth had filled in for lapses in the telling of your family story? did you find solace in finally getting it straight? love the wisdom of “the depth of the pain eqauls the depth of the love”. true for any type of loss. i will carry this thought with me always, thanks for sharing. The part about Dad not pursuing the Harvard MBA was a kicker for me, as I chose not to pursue the Kellogg MBA, although for very different reasons. His was about family, mine was about pursuing my artistic ideal. ‘Tis good to explore the family myths. The truth shall make you free. Woops…I forgot I was going to tell a quick story…about one of the times he remained quiet. “We” were installing a basketball hoop, backboard etc. and Dad of course was not lifting any tools, as was his custom. I was in my late teens, I was using a power drill, he was watching and the drill slipped off the surface and well, let’s say it was headed straight for the family jewels, it narrowly missed, I stopped the drill, there was several seconds of silence, wherein we contemplated what didn’t just happen, and –amazingly–no wise cracks, I just went back to work. But I knew in the silence, he was on the same page. It was a guy thing. Just Dad and me in the stillness. A couple of weeks ago or so, my 12 year old daughter and I took a little family history tour through my jewelry box – the one I inherited from my dear Great Aunt KT – Miss Kitty to her friends. Nestled in a special spot in the box is an opal ring that belonged to KT and which I have given to my young daughter because like KT and me, she has an October birthday and so the opal October birthstone ring is hers although it is kept in my jewelry box because for some reason things go missing when they enter my daughter’s room. We were looking at the ring and wondering how old it was — maybe 100 years old my little one thought. And we went from talking of the ring to talking of KT who had been named Atlanta’s Woman of the Year in 1952. After that we examined each charm on my Nana’s charm bracelets. One of the charms I explained was a Masonic emblem charm which my Nana had because my grandfather had been a Mason. I didn’t exactly know how to explain the Mason thing, so I just said that he was a member of a secret society. Bingo! Those were the perfect words to ignite her imagination. Her eyes lit up. This same grandfather shot off rockets with his good friend Robert Goddard the famous rocket science pioneer. My daughter then announced that the people in this generation were boring. No women of the year in this generation. No members of secret societies. No famous scientist friends. I tried to give examples of interesting people in the present generation, but she wasn’t buying it. Her dad is a fascinating guy and I was reminding her of that. She wasn’t impressed. And then I took a book of the shelf and handed it to her. The book is a collection of essays written by several Chicagoans. One of the essays is written by a judge who used to be the chief of staff for Mayor Daley and who is a friend of my husband’s. He inscribed the book to my husband with these words: “a person who does not realize, even today I’m sure, what a profound influence he had on our community — a friend whom I won’t forget”. And then my daughter was satisfied. She had tangible proof that her dad had influence because there it was written in this book. So my daughter found some truth about her father on our bookshelf just about the same time that you were finding some truth about your father in the top drawer. I still have my dad … “poppy’ as he’s known in our family. I grew up believing he could do anything and now, 50 years later, no one could ever convince me otherwise. Just this past weekend (on a road trip we took to my brother’s cabin in the very, very tall woods of northern AZ), I discovered things about him I never knew. His parents never urged him on to greatness in the educational sense, but he achieved greatness in so many other ways. He never graduated from high school, yet his brilliance amazes me. He’s my hero. bam … this posting moved me to tears. 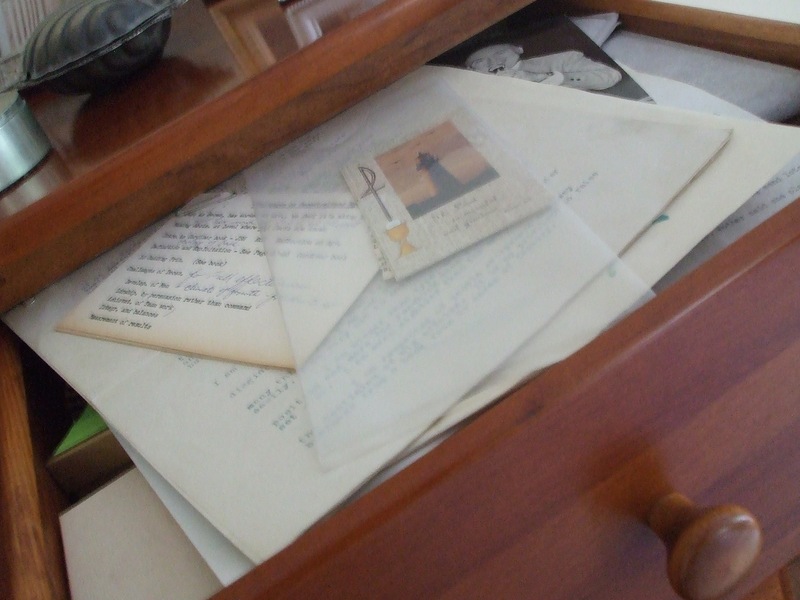 I could actually feel you opening that drawer, holding those papers, sitting on that bed. It was tangible … beautiful.